Lil’ One asked for mittens – so I made mittens. 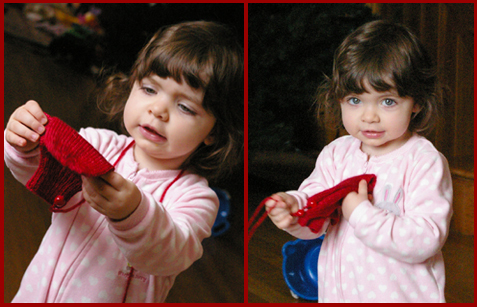 Like many toddlers, she didn’t want to wear mittens at first. I let her go out with a coat that covered her hands and patiently waited for here to understand why mittens were offered. 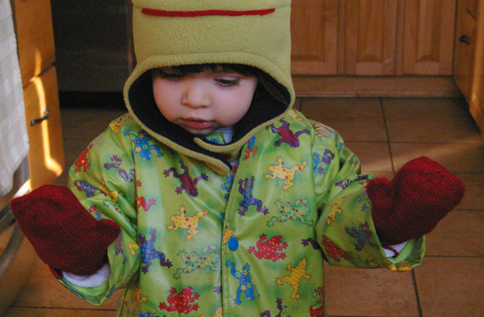 She explored the concept inside with her brother’s hand-me-down mitten (singular). She rolled the word around a while, adding to her growing clothing vocab, but still didn’t connect the item with going out in the cold. Then, while exploring the snow banks that were as tall as her, little fingertips found the icy cold snow and suddenly she turned her face up to me, hands raised in the air, and “mi’ens” were demanded. Well, of course, I got to knitting right away. 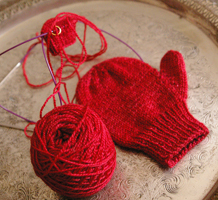 Rounded little red mittens for my sweet Lil’ One were knitted up pronto with leftovers from my Scarlet Sparkler Scarf. I channeled my Grandma’s style and added her patented keeper string, attached with buttons from my stash (will I ever have to shop for buttons again?). The button-on string is secure enough to keep them from getting lost, but allows me to wash them without the string tangling. She examined them, played with them, and now proudly asks for them whenever we go out… and sometimes when we hang out in our PJ’s! She makes me wish I still had chubby little hands for cute little mittens. The resulting free pattern is “Heart Strings Mittens” now available in my ravelry store or download now. You’ll need about 100 yards of sock yarn (perfect for leftover half or quarter skeins) and circular or dpns in size 1 & 3, and you’re good to go! Make some for the little one in your life who pulls on those heart strings! Send pics when you do, I love to see what everyone comes up with! Oh the cuteness! Love the idea of the button on string! Thanks for offering the pattern – I’ll be queueing it soon!! I do the string for my nieces and nephews, too. I remember those string-through-the-sleeve gloves very well! It really was the best idea. Sometimes I still wish I had them when I’m digging through my bag, looking for my gloves. I’ll have to send you photos of the new fleece winter hats I made for my teen craft project — very easy, and very cute. The Fuzzy Square is pleased to let you know that one of your heart strings mittens pattern is featured on the Fuzzy Square blog. Thanks for sharing! Have a Happy Valentine’s Day!